“Chichi! This is an awards ceremony! Surely there are exceptions made for this!” Tetsuo protested, his green eyes wide. Nowaki’s eyes flew wide at the confession, but he drew the little one into his arms, his mind awhirl at the sheer intelligence contained within Tetsuo’s skull. It was daunting to think that a little over a year ago, at age nine, the child had hacked three different heavily fortified systems with a school computer, hidden his location and presence, and changed encrypted files in a matter of minutes. Xiaolong had recommended a teacher for juku once, for a friend with a child similar to Tetsuo, and the man was coming to the house tonight to meet with and assess Tetsuo. Shohei and Xanthe were staying with Tetsuo to speak with the teacher in Nowaki’s and Xavier’s stead, with clear instruction that the study program would be with actual books and not to include computers. Tetsuo’s grounding was almost over, though his ban from computers still held for another year, and upon acceptance to university—his first choice, that is—he would again be trusted with technology. How do I explain to him, and explain to him to where he understands, that the intelligence he was blessed with does not give him the right to behave as though he were a god? That no matter if Carson deserves to be punished, that he does not have the right to punish him, that justice will be served, though we may not be around to see it? “Tetsuo, it was wrong because you are not a lawman. While you understand and have knowledge of the process behind the justice system, it does not mean that you can take it into your own hands. Musuko-chan, that makes you a vigilante and that is not a good thing. Vigilantes are still criminals, even if they hold good reason behind their actions. What is it that Xanthe says all the time?” Nowaki held the boy’s arms and he crinkled his forehead as Tetsuo visibly accepted defeat with his answer. “Good,” Xavier rasped before he took Nowaki completely into his mouth, swallowing him down. “Better than they were, but still not great. Heard you were in Cali and wondered if you were up to having houseguests for a bit. Brandon and I are bringing Christian out to UCLA to settle him in and we thought that if rumors were true, we’d hang out with our non-Boston… besties… if you will.” The soldier sounded amused as he used the vernacular and Nowaki chuckled as he heard Brandon laugh in the background. “Oh, that would be wonderful! I’ve not met him yet, and Brandon says he’s really down to earth, that when the band worked with him on the video for that last movie he was a ton of fun to work with. Christian would also really like it as one of his favorite movies is still the wizard one!” Judah laughed, a sound that Nowaki knew made Brandon’s heart swell. “Boyo isn’t taking his punishment well, is he?” Judah asked quietly. “Think Emrys will bring Lindsay, though?” Xavier queried, slipping out of his jacket and loosening his tie as he scooted a little lower on the swing, rocking his hips. Xavier dug in his pocket and produced a mostly used tube with a rueful smile. “Might still have some in it. My husband can’t keep his hands off of me,” he teased. “I know the feeling. My husband is the same way!” Nowaki joked back, taking the tube and working what he could out of it to slick Xavier as much as possible; he needed to have him inside him. “Might be a bit rough,” he warned as he positioned himself, and pushed down onto Xavier with a small cry. “You okay?” Xavier wept kisses over his throat and shoulders, his hands gentle on Nowaki’s hips. Almost an hour later, they were scrambling to get into their clothes after taking far too long in the shower—the bane of sharing one when we knew we wouldn’t be able to keep our hands off one another!—and Xavier asked Nowaki to grab his watch from his office. Nowaki laughed as he ran down the hall and cornered the doorjamb into the one room of the house that he could spend hours in just breathing: Xavier’s office. It smelled so good that before Tetsuo, the only way Nowaki could sleep when Xavier was away was by doing so on the couch in his husband’s office. The amazing scent of the Englishman’s cologne, bodywash and aftershave comingled with the cigars that he mostly carried like a worry stone or to give as gifts, had the power to instantly settle Nowaki’s nerves when Xavier wasn’t there to hold him at night. Conversely, that room—should he have been forced to stay in America during their time apart—would have been his kryptonite. 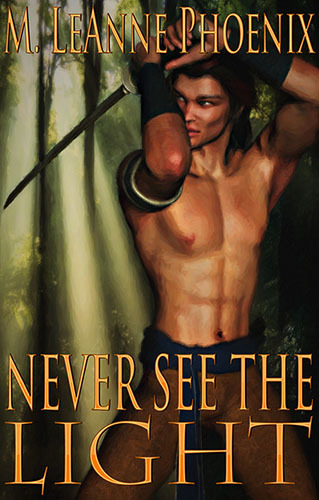 As he looked around a chamber created out of dark wood, hues of burgundy and hunter green, floor to ceiling bookshelves stuffed with books, swords on the walls, a telescope at one slender window; Nowaki felt desire filling his veins again and his smile turned up his lips as he padded across the wood floor to the heavy cherry wood desk. The glass top displayed many photos of the two of them, Tetsuo and Christian, Les Innocents, and a couple of Xiaolong with Nowaki and Tetsuo. As he reached out to touch the photo of himself and Xiaolong, his arm brushed across a stack of opened mail, sending it to the floor in front of the desk. I know that you are married and I know that you are madly in love with said husband. I don’t want you to think that I cannot understand that concept, but the thing is, Xav, I am happy that you have him back, and though I don’t need you to love me back in the same manner as I love you, I need you to know that I am in love with you. Your friendship is treasure enough for me, dearheart, and please understand this: all I wish for is your friendship. “Beautiful man? What’s keeping you? We need to get—” Xavier’s words died on his lips as he crossed the doorway into his office to see Nowaki crouched on the floor with the letters in his hands. He knows we are at the bridge, too. It has not escaped his attention that we need to proceed with caution. I don’t want to lose him and I believe him. I believe that he loves only me, that he doesn’t need anyone but me. He is a great actor, but when it comes to me, and to us, I’ve seen him try to withhold information, but never lie. “Xavier!” Nowaki rasped, pressing a kiss to his palm, his heart hurting for the man. “Do we have time, you think?” Xavier asked, and a smile touched Nowaki’s lips as he realized in that moment that his Englishman needed to divulge it and wanted to do so, but that he remembered they had prior obligations. “And so you left the comfort of your arrangement with Tobias?” Nowaki asked as they heard tires on the gravel of the drive outside. They whirled around to see Tetsuo sprinting towards them, arms outstretched, glasses crooked on his face, a crimson hat similar to a fedora crammed down onto his head, matching scarf wrapped twice around his neck over a tan trenchcoat to match Nowaki’s, his long hair coming out of the hastily made ponytail at the nape of his neck. Nowaki caught him up in his arms, one hand splayed over the back of his head as Xavier took the hat from Tetsuo’s head to press a kiss to his shiny jet hair. “The normal one. Is Papa really going to New Zealand without us?” Tetsuo quietly answered, and Nowaki knew the question broke Xavier’s heart. “I’m here going to school. UCLA, buddy. My dads are here, too, because the band’s recording in L.A. and… well, a representative of Canicus is here to talk to you.” Christian ruffled Tetsuo’s hair. “Not Canicus, Shimazu-san,” another voice interjected and Nowaki watched as a tall young man with broad shoulders stepped out from behind Christian. His soft golden brown hair, while long in front just touched the nape of his neck in the back. He bore features that were both brooding but attractive, and his gleaming seawater eyes were fringed with feathery pitch lashes. His shoulders were well defined and broad, and the grey short sleeved shirt showed off shapely arms and long fingered hands. The shoulders tapered into a tiny waist, slim hips and lean legs that screamed runner clad in loose black denim jeans, feet wrapped in black Doc Martens. The man folded one arm over his abdomen as the other hand reached up to smooth over the dark stubble covering his jaw.